A premium collection of uniquely-coloured stonecrops to bring your garden to life! The best-ever collection of drought-proof, multiple crowned Sedums, and a breeding breakthrough! A brand-new series of premium, succulent sedums and bang on trend for those of us interested in eco-friendly, time-efficient gardening, the ‘Sunsparkler’ series is already causing a stir with gardeners across the world. With their range of unique colours and easy-care nature, Sunsparkler sedums are exceptionally hardy and drought resistant, perfect for green roofs and living walls as well as more traditional garden borders. 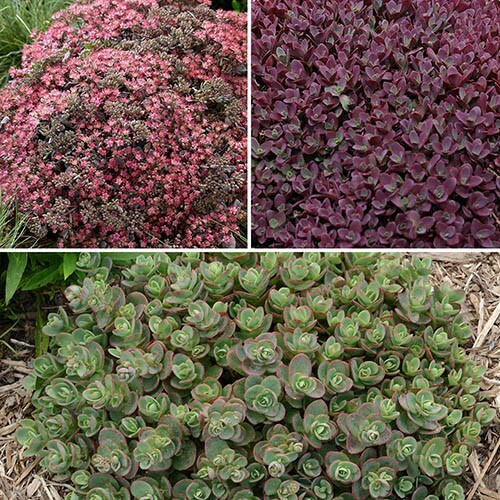 Officially known as Sedum Hylotelephium (or more commonly as Stonecrop), these fleshy-leaved perennials are real gems, standing out magnificently in the garden and forming dense mats of semi-evergreen, colourful, chunky leaves which are topped with starry flowers in mid-late summer. Bred to produce multiple crowns of growth buds, they really are a breeding breakthrough! Easy to grow, and virtually maintenance free, these gently creeping groundcover plants form a carpet of succulent leaves making them ideal to edge borders or line paths, then in mid-late summer, they're topped with masses of starry flowers that insect love. A superb collection of plants ideally suited to a sunny spot, they'll also thrive as striking specimen plants in patio pots or why not try them as unique edging plants to soften hard landscaping such as path edges. Supplied as 3 x established plants in 9cm pots, ready to be planted out. 'Dazzleberry' shines with raspberry flowerheads, and pearl-blue foliage which contrasts against the pink-red stems and changes colour and intensifies throughout the growing season. 'Lime Zinger' bursts with a multitude of zesty green, succulent leaves, each with a fine, bright red edge. Sprays of pink flowers top the multiple crowns in summer. 'Firecracker' sizzles with shiny, red foliage and large, medium-pink flowerheads from late summer to autumn. Sedums show their best colours when grown dry and in full sun. Grow in sandy, well-drained soil in a sunny position. Requires minimal maintenance and can resist heat and cold temperatures to -25°C. Water regularly during particularly hot, dry periods until the plants are fully established. Cut back the old stems and leaves after flowering to maintain their shape - although if you prefer, faded blooms can be left for winter interest.